Food combining is based on an essential set of principles that can help you to maintain a healthy flowing digestive system. The idea behind proper food combinations is simply that different foods digest at different rates in the body using different enzymes and digestive acids. This means each food group requires it's own unique digestive environment in order to break down the food correctly and provide optimal nutrient absorption. For example, if faster digesting foods (such as fruit) are consumed with longer digesting foods, (such as grains or meat) the fruit will be quickly processed and ready to move on but will have to remain in the stomach as the food consumed with it continues to be processed. This is when fermentation of the faster digesting food begins which leads to digestive challenges. Improper food combinations can result in that sluggish feeling after eating, bloating, gas and loose of essential nutrients. What are the benefits of food combining? Many people have experienced profoundly positive effects from practising correct food combining. From personal experience of practising food combining for over a year now, I have noticed many benefits and can definitely feel the difference after consuming an improper food combination. There are some basic principles one must follow in order to practise proper food combining. Below you will find a chart which will easily display these principles and is also available as a printable PDF version for you to download. 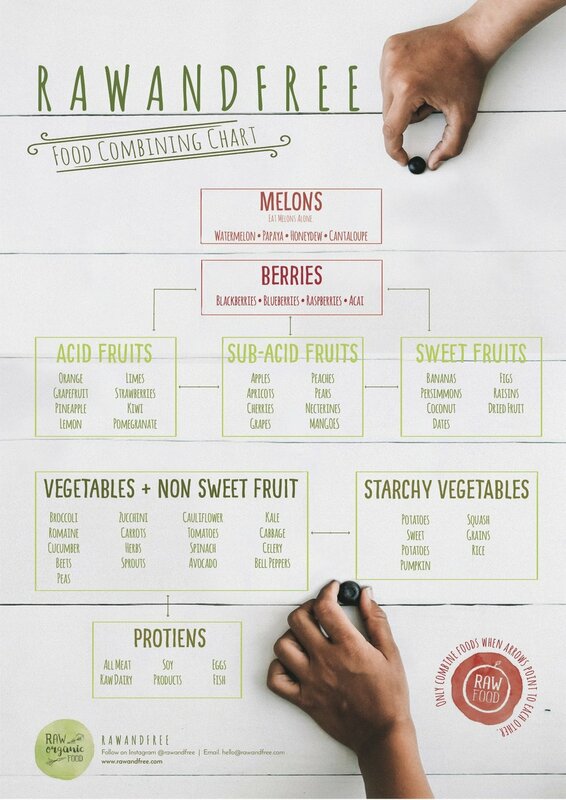 Click the link below to download the above Food Combining Chart.